I am sad to say that my Michigan State University (MSU) Fenske Fellowship experience has come to a close. Over the last few months, I have been working with my mentors to complete my final report, which details the last two years of my experiences and accomplishments as the 2014-2015 MSU Fenske Fellow. You can read more about my fellowship accomplishments, fellowship challenges, lessons learned, and my advice for future MSU Fenske Fellows in my final report. There, you will also find a reflection of the MSU Fenske Fellowship written by my two mentors, Dr. Bill Taylor and Bob Lambe. You can also view a full list of my MSU Fenske Fellowship-related products and additional products in the other document below. In the next few months, I will continue to wrap up a couple of related fellowship projects including an article for Fisheries magazine and a presentation about my MSU Fenske Fellowship experience as part of the MSU Graduate Student Organization Research Symposium. I will also attend and present at the Great Lakes Fishery Commission (GLFC) Lake Committee Meetings in March, 2016. I hope to attend other GLFC-related meetings when possible. Before I depart, I would like to extend a heartfelt thanks to my mentors, Dr. Taylor and Bob, and all other individuals from the GLFC who welcomed me with open arms and made me feel at home within their organization. I especially thank the U.S. and Canadian Commissioners who personally interacted with me on a number of occasions. Lastly, I would like to thank Dr. Dana Infante and the rest of the MSU Fenske Fellowship Review Committee for selecting me as the 2014-2015 MSU Fenske Fellow and supporting me through this process. It has been an adventure. Cheers. LESSON #29: Be grateful for good opportunities. LESSON #30: Keep in touch with those who give meaning to your life! 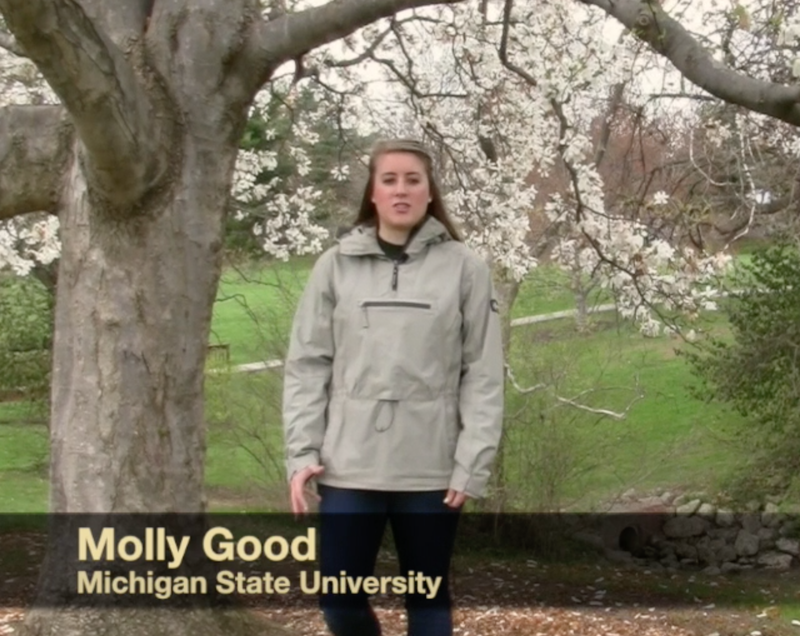 View Molly’s final MSU Fenske Fellowship Report here. View Molly’s MSU Fenske Fellowship-related products and additional products here. View Molly’s article, “The MSU Fenske Fellowship: Fresh Perspectives on Fish, Management, and Law” here. This article appeared in Fisheries magazine in 2016. Recently I’ve had a flurry of Fenske Fellowship activities, all of them memorable! After returning from the holiday break on January 6, I met with Troy Zorn, Michigan DNR Fisheries Research Biologist and Fenske mentor, on campus in East Lansing. We exchanged stories of our time away from work … mine back home in Minnesota with family and friends (with an awe-inspiring Rachel Carson biography in hand), and Troy’s on a marine fishing adventure! After recounting our holiday memories, we got down to business on Fenske developments, charting a course for a busy month of Inland Trout Angler Survey (ITAS) and Inland Trout Management Plan (ITMP) work. We both acknowledged the need for a formal document describing results from the ITAS and decided to format the summary as a Research Report, DNR style. Talk about fisheries management experience! So far, the Fenske Fellowship has provided unparalleled opportunities to see the fisheries world from an applied research and management perspective. Troy and I decided that the Research Report should transcend mere description of ITAS results. We settled on a format that will both report results and compare them to previous angler surveys, including a recent survey completed by the Wisconsin Department of Natural Resources. We believe providing context for our results will enhance the utility of the Research Report for advancing stream salmonid management. Speaking of context, our analysis of the ITAS is occurring simultaneously with development of the ITMP and with publication of a manuscript (Carlson et al. 2016) that Troy and I co-authored with Dr. William W. Taylor (my Ph.D. advisor at Michigan State University), Dr. Dana Infante (MSU), and Kelsey Schlee (M.S., 2014, MSU). In this paper we predict future stream temperatures in Michigan using coupled climate models and relate temperature to projected effects on growth and survival of brook trout, brown trout, and rainbow trout. This is timely information, given the importance of managing streams for thermal resilience in a changing climate. The connections among the ITAS, the ITMP, and this recent paper are numerous, and I gave a formal presentation on them at the recent Midwest Fish and Wildlife Conference, held in Grand Rapids, MI (January 24-27). Troy also gave a presentation, and we had the chance to meet and discuss our writing assignments for the ITAS and the ITMP. We’re happy to report that as of yesterday (January 31), the first draft of the Research Report is complete. 65 pages and counting, with many more interpretations, conclusions, and tables to add. We’ll keep you posted as our work on the Research Report and ITMP progresses! Stand-alone results from social surveys are interesting, but they become truly valuable for fisheries management when researchers interpret them in the context of previous studies. The recent Wisconsin trout angler survey has provided invaluable context for understanding results of the ITAS. My work with Michigan DNR mentors has been rewarding and eye-opening … a wonderful supplement to my formal education on campus in East Lansing. I encourage all aspiring natural resource professionals to network with veterans of their profession. 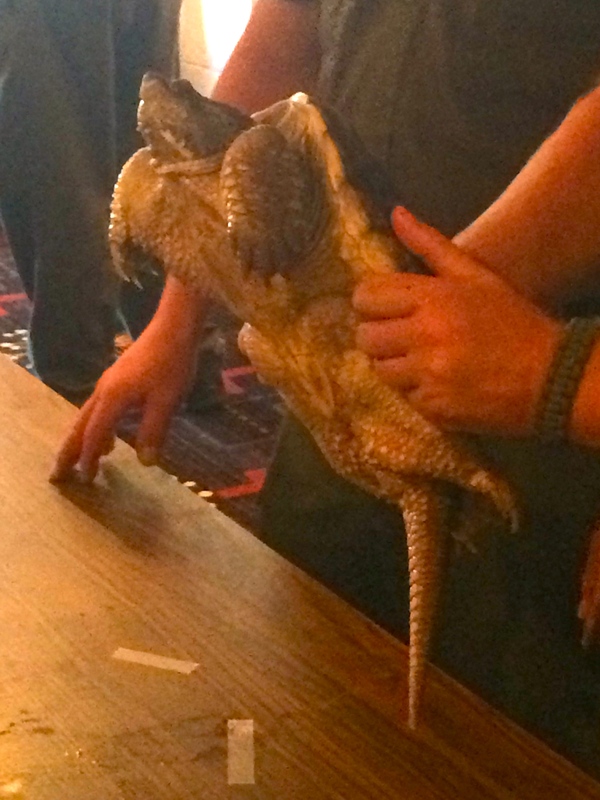 Events like the Midwest Fish and Wildlife Conference provide valuable networking opportunities. But it doesn’t end there. Contact natural resource professionals in your area to learn about how to get involved. You won’t regret it! 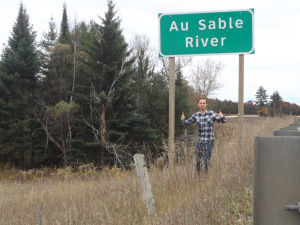 Just over one month after the Coldwater Resources Steering Committee (CRSC) meeting, I made another scenic journey to Michigan’s northern Lower Peninsula. The destination for 12/1/15: Bellaire, home of Shanty Creek Resorts, where the 2015 Michigan DNR (MDNR) Fisheries Division Meeting took place. As soon as I walked beneath the enormous wooden entryway and sensed the unmistakable fragrance of the northwoods, I knew I was in for an enjoyable morning. I entered a cabin-like hallway replete with photographs and paintings of hunting expeditions of yesteryear. I admired the meticulous detail and impeccable accuracy of deer, ducks, and grouse, those animals of endless fascination. In a wildlife dreamland, I slowly made my way to the meeting registration table. To my surprise, there were nametags featuring clear, crisp images of common Michigan recreational fishes and bags with an embossed Michigan DNR Fisheries Division logo! Quite a professional event, I said to myself, thinking of my many undergraduate meetings with the Minnesota DNR (first as a volunteer, then as an employee) during my days at the University of Minnesota. The stage was set for a memorable meeting. The meeting featured sessions for various Committees of the MDNR, including the Trout Committee, where I presented full results from the 2015 Inland Trout Angler Survey. Whereas my talk at the CRSC focused on differences between angling group members and non-members in Michigan streams, in this presentation (PDF:CRSC_TroutCommtalk) I characterized the factors that drive typical, “overall” anglers to fish streams and inland lakes for brook trout, brown trout, rainbow trout, lake trout, and splake. I discussed anglers’ responses to a wide range of questions, including those related to angling experience, fishing trip planning, stream and lake selection factors, harvest and tackle use patterns, and overall satisfaction with trout management in Michigan. I was grateful to hear from managers that I provided the details they sought, information that will help us understand the values, attitudes, and behaviors of public stakeholders as we develop a statewide management plan for inland trout. Another incredible Fenske Fellowship experience! A professional presentation is valuable in proportion to how effectively a speaker communicates with his/her audience. In transitioning from my first to second presentation, I made a more conscious effort to consider my audience (i.e., salmonid managers) and the specific information they desired. I am certain this improved the quality of my second talk. In my experience, professional talks represent outstanding opportunities to channel personal enthusiasm toward effective scientific communication. Speak with your heart, and good things will happen! At the Trout Committee meeting I received a thought-provoking question about the degree to which my sample population (N = 4,161) accurately represented Michigan trout anglers. Knowing that survey respondents were typically male, age 50-65, and members of angling groups (and invariably provided their emails after purchasing licenses), I responded to this question to the effect that my sample population was not fully representative. To expect a completely representative population is unrealistic, but it is important to acknowledge the inherent biases in a survey and transparently communicate these to audiences at professional meetings. The MDNR fisheries community is a wonderful group of passionate scientists, managers, and biologists who care deeply about the health of aquatic resources within and outside Michigan. Collectively (and in many cases individually), these fisheries professionals are a walking encyclopedia of information. For a Ph.D. student like myself, networking with the MDNR fisheries community is an incredible extracurricular experience. I’ve learned facts about fisheries research and management that no amount of classroom instruction could provide. And I’ve had lots of fun! In a festive, holiday-themed room, members of the Michigan DNR Trout Committee discuss results of the 2015 Inland Trout Angler Survey after my presentation. I made the scenic journey north from East Lansing to Hartwick Pines State Park to attend the fall meeting of the Coldwater Resources Steering Committee (CRSC). The CRSC is composed of members from angling organizations as well as individuals unassociated with any organization who have an interest in Michigan’s coldwater resources. The purpose of the CRSC is to provide input, advice, and recommendations to the Michigan DNR Fisheries Division on issues related to the state’s coldwater resources, as well as strategies and goals for managing those resources. As a grateful 2015-2016 Fenske Fellow, Andrew is working with Dr. William W. Taylor (Michigan State University) and Dr. Troy G. Zorn (Research Biologist, MDNR) to analyze results from the 2015 Inland Trout Angler Survey (Survey). The goal of this project is to understand values, perceptions, and behaviors of Michigan trout anglers and collaborate with MDNR fisheries managers to write a statewide management plant for inland populations of brown trout, brook trout, and rainbow trout. At the CRSC meeting, Andrew presented preliminary results from the Survey, providing MDNR managers with valuable information for understanding trout anglers. Andrew looks forward to continued collaboration with the MDNR (and Fenske Fellows blog posts!) as survey analysis progresses. Evidently there are two “Great Lakes” Commissions. One is the Great Lakes Fishery Commission (GLFC). Did you know about that one? Hehe. The other is the Great Lakes Commission, which promotes the integrated and comprehensive development, use, and conservation of water resources (though they address fisheries issues, too!). 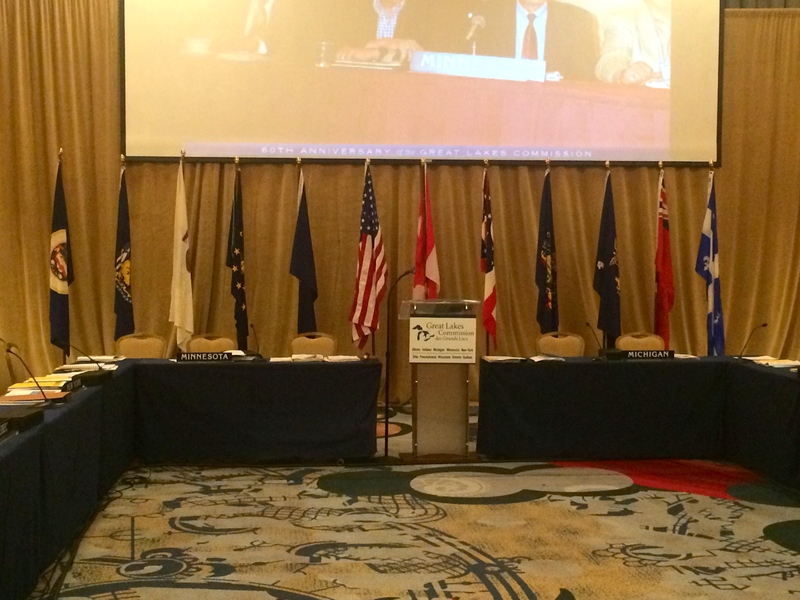 Well, the Great Lakes Commission celebrated its 60th anniversary this week in Chicago, Illinois. The Commission invited the GLFC Commissioners and Secretariat to join the celebrations and participate in joint discussions with a focus on invasive species, nutrient reduction, and waterfront revitalization. 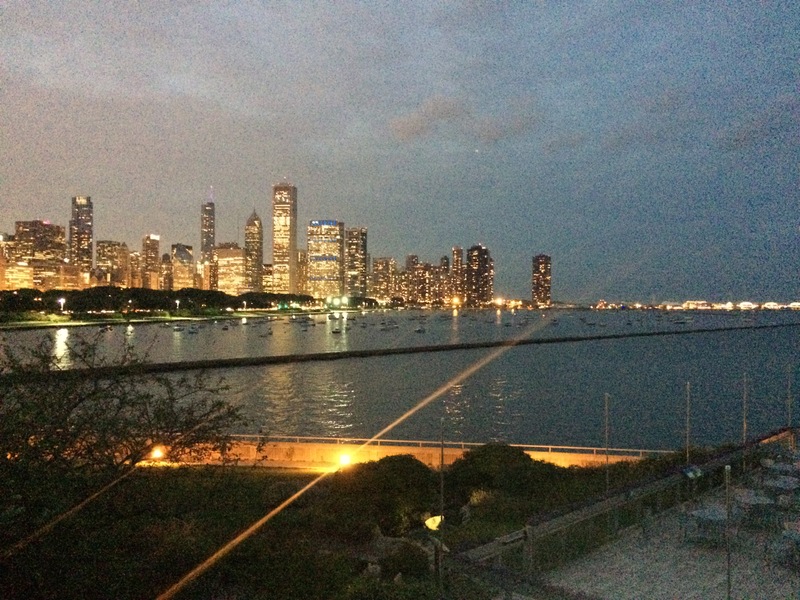 The Great Lakes Commission sponsored a reception at the Shedd Aquarium that evening with excellent food and wonderful company. I had a blast connecting with members from BOTE and SLRB and some of the Commissioners. The GLFC held a separate Executive Meeting on the second day of anniversary meeting. There, we discussed a few more loose ends from our Executive Meeting in June regarding the strategic evaluation of the GLFC vision. This project is coming to a close. LESSON #27: It is not easy to have a conference call on a party bus. LESSON #28: If you are in a party bus and you look hard enough, you will find beer. 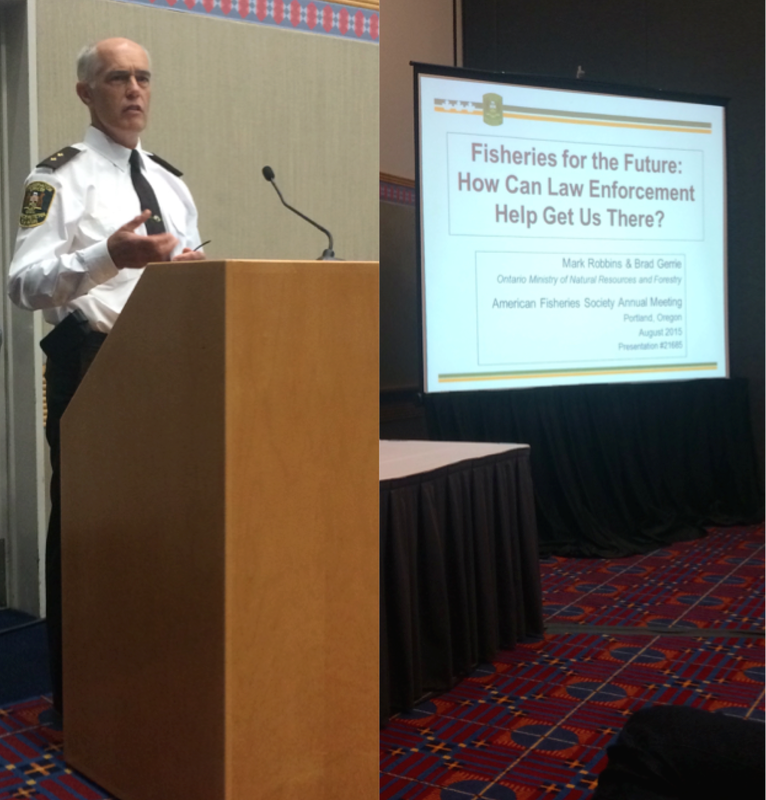 I was eager to give the Law Enforcement Committee members a synopsis of my symposium at the 145th American Fisheries Society (AFS) Annual Meeting last month. I described the objectives and structure of the symposium in addition to comments and questions generated by the audience. 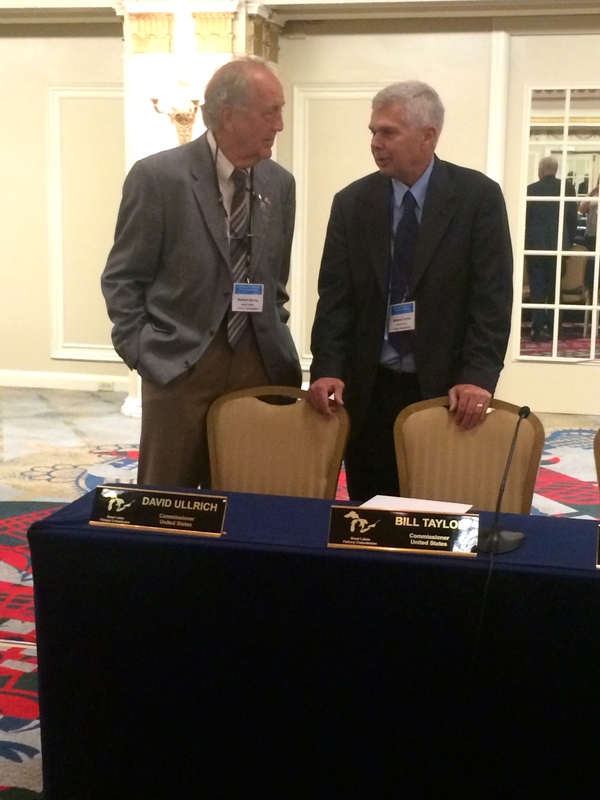 The committee members were pleased that they were well-represented at the fisheries meeting. The members also recognized the importance of maintaining this type of representation and exposure at future fisheries meetings. The committee members made me feel like my Fenske Fellowship project has been successful thus far. I think they are looking forward to see what we can do together in the future. Sometimes I wonder if my research is going to produce meaningful results; results that can be used and will actually impact something or someone. Sitting in this meeting and listening to the questions, concerns, and stories discussed by the committee members reaffirmed, for me, that my research is important. I think I am finally at the point where I can successfully define meaningful research objectives and goals – without the experiences the Fenske Fellowship has provided for me, I fear this realization may have never come. We ended the Law Enforcement Committee Meeting with another training. The objective of this training was to instruct the committee members on the proper identification of turtle species in the Great Lakes Basin Region. 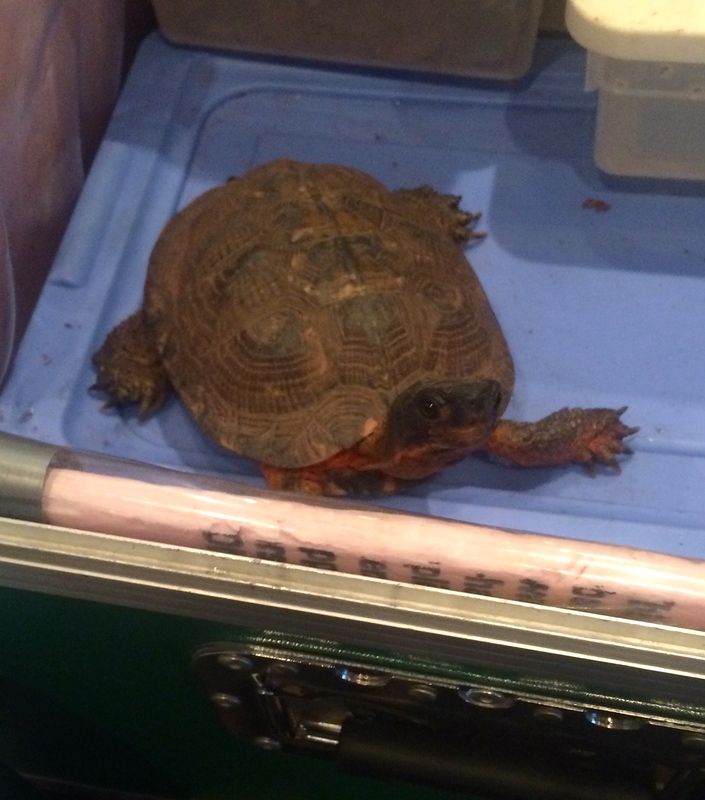 I do not encounter turtles very often in my research, so the species identification was difficult for me. My favorite turtle was the snapping turtle, mainly because it was the largest and most active of those we observed. LESSON #25: Fisheries law enforcement is just one component of fisheries management. All components must collaborate and work together to implement effective fisheries management. LESSON #26: The GLFC Law Enforcement Committee is interested in learning about how it can improve fisheries law enforcement on a basin-wide scale. Hi readers. We, the MSU Fenske Fellows, have a new Facebook account! Please consider “friending” us at “Msu Fenske Fellows.” There, you will get first access to exclusive updates and blog updates, as well! Congratulations to the two new Fenske Fellows, selected for the 2015-2016 school year! Please welcome Master’s student, Elle Gulotty, and Ph.D. student, Andrew Carlson, to the Fenske community! Elle will work on a project with her graduate advisor, Dr. Dan Hayes, and her Fenske mentor, Dr. Tammy Newcomb from the Michigan Department of Natural Resources. Andrew Carlson will work on a project with his graduate advisor, Dr. Bill Taylor, and his Fenske mentor, Dr. Troy Zorn, also from the Michigan Department of Natural Resources. You can follow both of their Fenske adventures here on this blog. Congratulations again, Elle and Andrew! 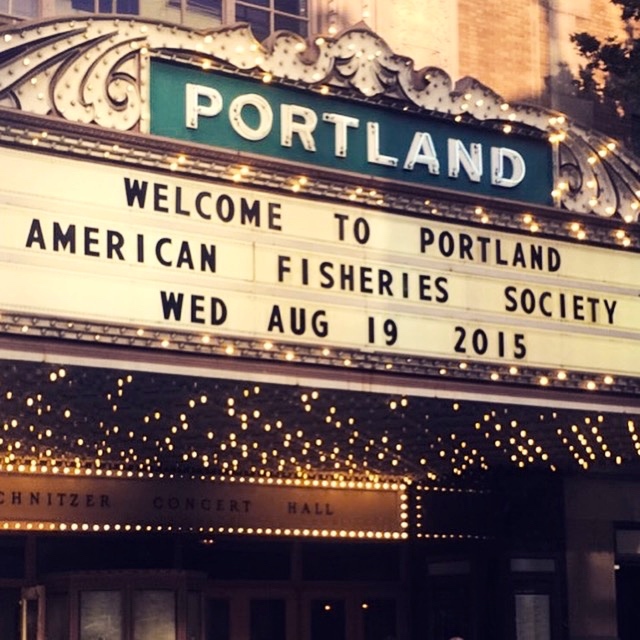 I just came back from the 145th American Fisheries Society (AFS) Annual Meeting in Portland, Oregon. The meeting was spectacular and I made a lot of progress on my Fenske Fellowship work. On Monday, August 17, 2015, I gave the first presentation in my symposium entitled, “Fisheries Sustainability, Crime, and Enforcement: Whodunnit and How Do We Manage It?” Ten other presentations followed after mine. The symposium session was extremely well-attended, with approximately 20-40 individuals present at any one time, and each presenter was challenged with some excellent questions. I think we were successful in raising the profile of fisheries law enforcement on a national scale, and I am eager to pull together the research findings from this symposium into a manuscript for Fisheries Magazine. For a copy of any presentation in this symposium, please contact me at goodmoll@msu.edu. On Thursday, August 20, 2015, I showed a brief video entitled, “Legally Licensed: The Conservation Benefits of Buying a Fishing License” in the first AFS Film Festival. The idea for this video originated in one of the earlier meetings I participated in with the Great Lakes Fishery Commission (GLFC) Law Enforcement Committee. Lastly, I organized another Fenske Fellows get-together for the Fenske Fellowship Committee and past fellows. Fenske Fellowship Committee members Gary Whelan (Michigan Department of Natural Resources), Jess Mistak (Michigan Department of Natural Resources), Dr. Dana Infante (Michigan State University), and Fenske Fellows, Dr. Abigail Lynch (United States Geological Survey), Hanna Kruckman (Eastern Illinois University), Dr. Amy Schueller (National Oceanic and Atmospheric Administration), me, and Andrew Carlson dined at the Hilton Hotel in Downtown Portland. (From L to R) Dr. Abigail Lynch, Hanna Kruckman, Jess Mistak, Molly Good, Andrew Carlson, Gary Whelan, Dr. Dana Infante, Elle Gulotty, Dr. Amy Schueller, and Ray Schueller. LESSON #22: Nationally, law enforcement officers experience challenges in effective collaboration. LESSON #23: Law enforcement success or effectiveness is hard to quantify. LESSON #24: It is possible for your purse to be stolen anywhere, even in nice hotels. View Molly’s presentation, “Law Enforcement: A Critical Management Tool for Ensuring Fisheries Sustainability,” given the American Fisheries Society Meeting here. View Molly’s summary of the AFS Law Enforcement Symposium entitled, “Fisheries Sustainability, Crime, and Enforcement: Whodunnit and How Do We Manage It?” here. This summary appeared in Fisheries magazine in December, 2015. My symposium for the upcoming 145th American Fisheries Society (AFS) Annual Meeting was named as one of the “most unique” symposia of the entire meeting! LESSON #21: Bask even in the smallest of victories. View Molly’s nomination for the “most unique” symposia of the AFS Annual Meeting here. This nomination appeared in Fisheries magazine in August, 2015.